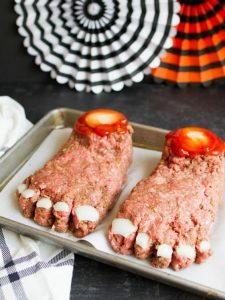 Dinner Recipes to Make Halloween Night Healthy and Fun with These Easy Meat Recipes. Keep your kids tummies full of healthy protein dinner recipes as they go out-trick-or-treating on Halloween. These recipes are fun, fast, delicious and fabulously gross. 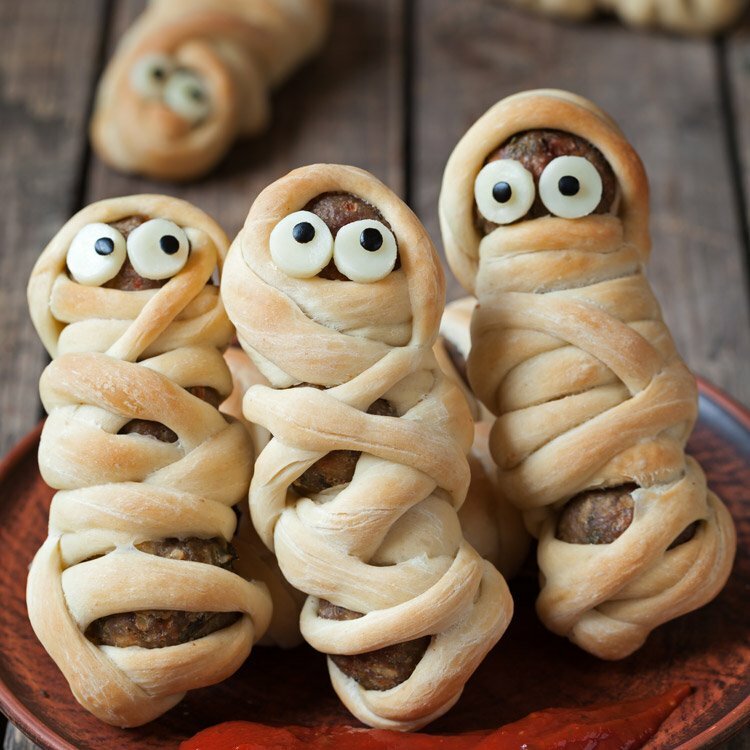 Your tweens will love these spooktacular meals and snacks. 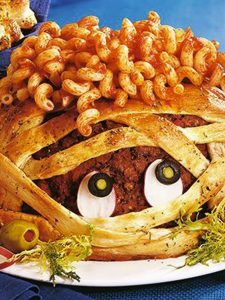 Kids will love these weirdly delicious and kinda gross halloween meals. 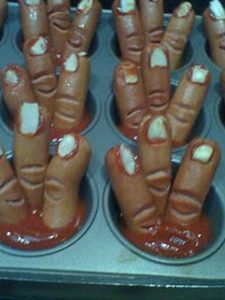 Bloody finger hot dogs for Halloween – not for the faint at heart. 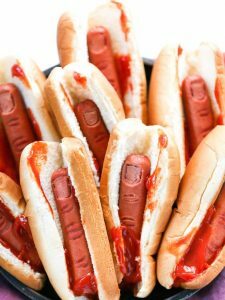 This detached finger recipe made from hot dogs is truly gross. But then that’s what it’s all about! 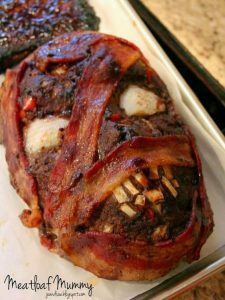 The face is made out of meatloaf with onions and bacon. The snacks of chicken wings and sausage are served in foil containers. 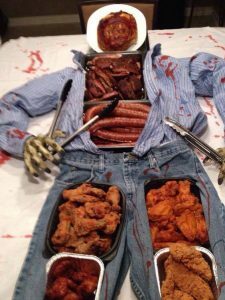 This is a great table presentation for adult halloween parties. Shape the ground meat into a hand and arm and add onion as a bone for the elbow an fingernails. Ketchup spread over the top makes it look…delicious…pop it in the oven. The skeleton sausage and cheese platter presentation is a must for any adult Halloween party with a hankering for sausages and cheese. 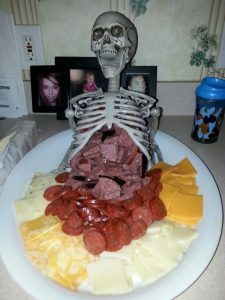 Is it just us or is this a very disturbing halloween sausage and cheese presentation featuring a skeleton with sausage and cheese coming out of his innards? OK, now let’s tone it down a bit. The Halloween recipes below are tasty and good for your little trick-or-treaters. 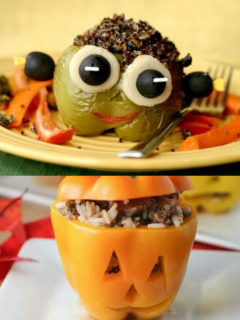 stuffed Jack-O-Lanterns made from green and yellow peppers filled with macaroni or ground meat. The meatball sandwich to the next level. 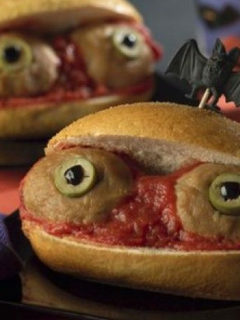 Celebrate Halloween with this easy to create and splendid meatball creation. cut open a hamburger bun, lace it with ketchup or tomato sauce. Place two meatballs inside and slightly apart. Add a round pickle in the center of each meatball with a half olive. Your kids won’t be able to resist this masterpiece. Have fun this Halloween. Be safe, wear a reflector and enjoy the season.